More Earths Than We Thought? Even if you're a big fan of exoplanets  that is, worlds orbiting stars beyond the sun  the flurry of major discoveries over the past few months may have been hard to process. Astronomers have lately reported the blackest planet ever found, the most habitable, the one with the best Star Wars connection and, just a couple of weeks ago, the even-more-habitable-than-the-previous-most-habitable one  and that's not even a complete list. The ultimate goal, virtually all planet hunters agree, is to find a mirror Earth  a world about the same size as our home planet, with a relatively balmy temperature making it friendly to life. And a discovery just published in Nature takes scientists one major step closer to that crucial milestone. Using the powerful Kepler space telescope, a team that includes some of the world's most prominent exoplaneteers has found one world almost exactly the size of Earth, and a second, a bit smaller than Venus, orbiting a star known as Kepler-20, some 950 light-years away. "I'm really excited," says David Charbonneau, a Harvard astronomer who was part of the discovery team. "This is the goal line." It's one foot across the goal line, anyway. 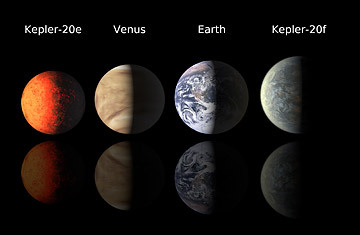 The Earth-size planet, Kepler-20f, is clearly too hot to sustain life, with a surface temperature hovering around 800°F (427°C); the Venus-size world, Kepler-20e, is a scorching 1,400°F (760°C). "It's clearly not habitable," acknowledges Charbonneau, "but we've now shown definitively that Kepler can find planets this small." That's a good thing since Kepler's official mission is to do just that. Since its launch in 2009, the telescope has found more than 2,000 "planet candidates" by looking for the slight dimming as a planet transits, or passes in front of, its star. Last February, the mission's principal investigator, Bill Borucki, of the NASA Ames Research Center in California, announced that 68 of these candidates looked to be Earth-size. But to qualify as a formal discovery, a candidate planet has to be independently confirmed, lest it be something else in disguise. It's possible, for example, that there's a binary, or double star in the background just behind one of Kepler's target stars. If so, you're really looking at the light of three stars at once, and if one of the background stars moves in front of the other, the light can dim just enough to mimic the signal of a planet. Or the target star itself could be a double, with a giant planet orbiting one of the two individual stars. You'd have found a planet, says Harvard's Francois Fressin, lead author of the Nature paper, but "you'd get a misleading estimate of the planet's size." The best way to double-check is to look for a back-and-forth wobble in the parent star, caused by the planet's gravity as it orbits, but that's tough if the star is too dim, as Kepler-20 is. "You might be able to do it," says Fressin, "but it would take a crazy amount of time"  although a new instrument about to go into operation in the Canary Islands will likely make that an easier and quicker job. Instead, the scientists who made the current discovery resorted to a powerful simulation tool known as Blender, invented by Harvard astrophysicist Guillermo Torres, yet another of the paper's co-authors. What Blender does is simulate all possible combinations of background stars, giant planets and other phenomena that could mimic the signal of an Earth-size world  literally millions of them  and calculate the odds that Kepler has been fooled. In this case, the answer was statistically conclusive: any explanation other than a real planet is vanishingly unlikely. What Blender can't do, but gravity-induced wobbles can, is measure the planet's mass. With both mass and size in hand, astronomers can calculate density, and figure out what a planet is made of. When Charbonneau himself found a world just three times the size of Earth back in 2009 with a ground-based telescope, the wobble calculation showed that the planet, GJ 1214b, is probably made largely of water, with no solid surface. In the current case, nothing is certain, but even so, the scientists argue that these two new worlds are almost certainly rocky, like Earth. They're too small, says Fressin, to hold onto water vapor and other gasses so close to their parent sun  so even if they once had thick, Neptune-like atmospheres or a very deep ocean, these would long since have boiled away. For those who keep up with planet-naming conventions, the fact that these new worlds are labeled e and f makes it clear that they're not the only planets orbiting Kepler-20. There are actually five in total  the two small ones, plus planets b, c and d, which are more like Neptune in size. (There is no planet a; the star itself occupies the top spot.) Such alphabetical neatness does not mean that the planets in the Kepler 20 system are arranged in anything like an orderly fashion. In our own solar system, big planets and small planets inhabit their own macro zones around the sun, with the little ones up close and the big ones farther away. In this case, the closest-in world is big, the second is small, the third big, and so on. "The architecture of this solar system is crazy," says Charbonneau. "I'm asking for help from the theorists because I'm teaching a course on planet formation this spring, and this deeply challenges our theoretical models. My freshmen are going to be asking tough questions." It's unlikely that theorists will have a definitive answer any time soon, but while they're working on it, Kepler will keep searching, and astronomers will keep following up to turn the satellite's harvest of candidate planets into confirmed ones. "Two weeks ago," says Charbonneau, "we announced a planet in its star's habitable zone but which was much bigger than Earth. Today, we're announcing a planet that's the same size as Earth. What we want is the best of both  a true twin of Earth. Hopefully," he says, "well find it within the next year." Watch TIME's video "Herschel: The Telescope for Invisible Stars." See pictures of the Hubble Space Telescope's greatest hits.